I was blessed/cursed with a massive savoy cabbage in my organic veg delivery last week. What to do? There’s really only one way to dispose of a huge amount of cabbage, and that’s in a soup. This recipe is from the brilliant and dependable A Celebration of Soup by Lindsey Bareham. Chop a small onion and soften it in butter alongside about 100g of bacon. Add 450g of sliced cabbage and a peeled, diced potato to give the soup some body. Cook for a few minutes, season and add 1.1 litres of chicken stock. Cook gently for half an hour, leave to cool a bit then blitz in a blender. I nearly tripled the recipe to dispose of my whole cabbage mountain. 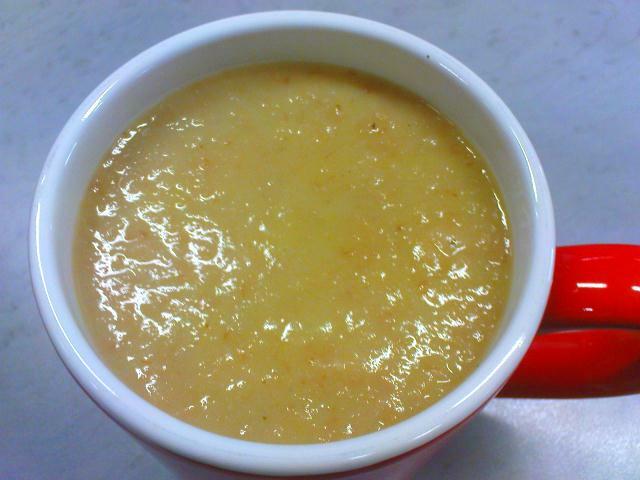 The resulting soup is smooth, tasty, full of depth and flavour. The bacon is indispensable. Finish with croutons and a ‘swirl of cream’. Great fresh, even better out of a flask at work the next day.